How Much Does it Cost To Fly To St. Louis? The cheapest flights to St. Louis found within the past 7 days were $67. Prices and availability subject to change. Additional terms may apply. John F. Kennedy Intl. - Lambert-St. Louis Intl. LaGuardia - Lambert-St. Louis Intl. Liberty Intl. - Lambert-St. Louis Intl. Standing under a perfectly sculpted silver arch, you feel as if you’re on a precipice. Your future is within reach, just on the other side of the metallic ribbon. Along the horizon, where the sun is beginning to set on another day, you can spot the infinite. “Yes,” you remark to no one in particular, “this really is the Gateway to the West.” The Midwest soil where you stand gives way to the western region of the country, and it also embodies the spirit of a westward bound traveler. It inspires you to ride off into your own sunset, toward possibility and against the current of the expected. Welcome to St. Louis, Missouri. 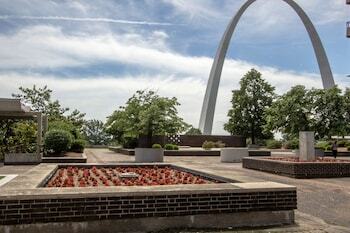 You’re a savvy traveler, so flight deals to St. Louis will feel familiar. Yes, the satisfaction of saving big on your transportation is matched only by the sense of contentment you feel after devouring a plate of ribs so tender they fall off the bone. Book your St. Louis flight on Travelocity today, and before you know it you’ll be elbow deep in barbecue sauce. Flights to St. Louis never leave eager travelers high and dry. No, wise wanderers such as yourself can easily navigate your way to your hotel. In fact, you have plenty of transportation options; before you know it, you’ll be all checked in and off to your first adventure in The Lou. In addition to rental cars and taxis, which are available outside of Door 14 on Terminal 1 and Door 12 on Terminal 2, you can also hop on the MetroLink and head into the city via light rail. 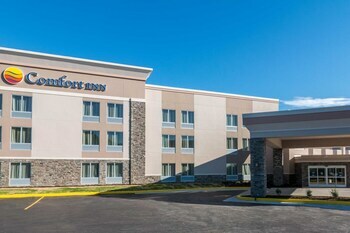 Your hotel may also offer a free shuttle, or you can call an Uber from the arrival terminal once you’ve picked up your luggage from baggage claim. 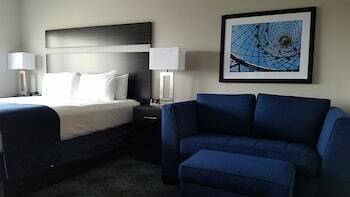 Hyatt Regency St. Louis at The Arch: This hotel is just steps from the famous arch in the heart of downtown St. Louis. Contemporary furniture and modern amenities, like iHome stereos decorate the rooms while an 18th floor outdoor terrace overlooks the Mississippi River. You can grab a bite at the Ruth’s Chris Steak House without ever leaving the hotel. 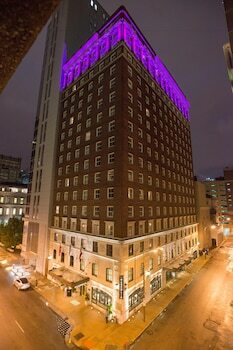 The Westin St. Louis: When you want to get pampered, The Westin caters to what you need. Get an in-room spa treatment, enjoying aromatherapy and relaxing music as you get a massage. Heed the call to get your blood pumping again, and get a running map from the front desk or take a 3-mile group run lead by the hotel running concierge. HoteLumiere Suites and Casino: Chic is your style, and the HoteLumiere is like coming home. Sip on a cocktail as you look out at a four-story waterfall, and go to sleep at night on Egyptian cotton sheets. Each suite has an Italian duvet and two flat-screen TVs. 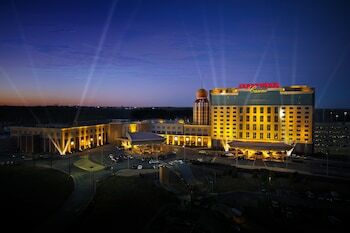 The Chase Park Plaza: Are you in St. Louis or indulging in a vacation abroad? 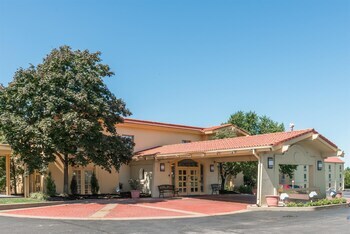 The Chase Park Plaza is a historic property with European touches and a Mediterranean-style pool. 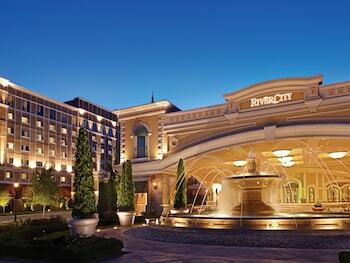 From elegant chandeliers to hip restaurant décor, you’ll be swept away. After your trip to the top of the Gateway Arch, you’re ready to wisely wander through the rest of The Lou. Take a slow, easy walk through Forest Park and excite your senses at the St. Louis Science Center. Of course you can’t leave the city without tasting some of its liquid gold: local brew. Take a tour of the Anheuser-Busch Brewer and sample the goods. The brew and culture of The Gateway City is calling. Book St. Louis plane tickets with Travelocity now, and soon you’ll be pondering your next move. Standing in the Gateway to the West, anything seems possible. It all starts with one of our cheapest flights to St. Louis, so let’s get booking. Great View, very close to the arch and the ball field. Very good service. Spacious room. Nice environment. Would definitely go back. Definitely. Our stay was nice except for the air conditioning was extremely poor , need updating . Other than that great views and location ! !